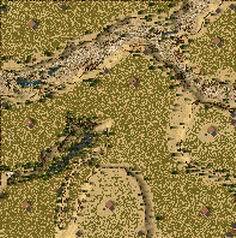 Anderton is an 8 player map, I give you 2 versions, one has 2 outposts each and the other map has no outposts, I thought I would add this one so you can play Crusader and have 10,000 troops to play with, you will have the power bar, up to you if you use it. The map is made to be more natural and more Mediterranean than desert, the stone is in the dry riverbed and some pitch can be found and you will all have a little iron, trees and growing land will be plentiful, I marked them as unbalanced because of the stone. Very nice map - I have just downloaded it. The map looks natural indeed, and I like the design of entire map. I also like the canyon. Really great job! Thanks guys, just a quick map, I made it 8 player so you can have more options, and threw in the no outposts map for fun. I will make another map this time I will try and make it in SHC then convert it to be used in Extreme, this time without outposts and no power bar. Anything in particular you would like to see in a map, no promise but you might see your ideas in the next map! Lord Dredde, still in the game I see, good to see you around. I have been playing around with Extreme for a little while, trying to make the game more interesting with purpose build skirmish maps. I have a new map that EaglePrince and I played the other day, it has 3 spots for you and 2 allies no outposts and 2 spots further away for enemy allies and they have 4 outposts each, now that was an intense game! This map is an ordinary skirmish, one with outposts and one without so you can have large armies and no outposts. Are you still making maps? Yes I'm still around, only to give advice, as I am engaged with SHK.